The mango, considered a tropical fruit, is a flattened to oblong fruit with colorful skin and sweet, orange-red flesh. Because of the many varieties, mangoes range in size and can be small like an egg, oval, round, heart or kidney shaped, long and slender and weighing up to 5 pounds. There is a distinct tongue shaped seed, or pit, that parallels the shape of the pulp and must be cut around to free the flesh. 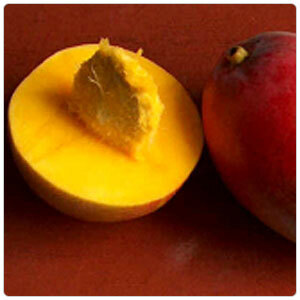 Most mangoes are hard when you buy them and must be fully ripened before eating. As with other tropical fruits, they may be eaten on their own or added to fruit salads. Combine well with avocados and herbs such as mint and cilantro and used to make fruit salsa. Mangoes may be used to make jellies, jams, tarts and chutneys, and are popular in tropical drinks such as daiquiris. Originating in Southeast Asia, today India produces an estimated two-thirds of the World's mangoes. More than a thousand mango species fall into two branches: the Indian, with regularly shaped, brightly colored fruit and the Philippine, also known as Champagne or Altuafo mango with bright yellow, kidney shaped fruit.